Majority global wind/solar activity now in non-OECD countries; new coal build craters, innovative policies, and lower technology costs drive change. Shanghai, November 27, 2018 – Surging electricity demand, sinking technology costs, and innovative policy-making have allowed developing nations to seize the mantle of global clean energy leadership from wealthier countries, a comprehensive new study from BloombergNEF (BNEF) concludes. In 2017, developing nations added 114GW of zero-carbon generating capacity of all types, with 94GW of wind and solar generating capacity alone – both all-time records. Concurrently, they brought on line the least new coal-fired power generating capacity since at least 2006. New coal build in 2017 fell 38% year-on-year to 48GW. That represents half of what was added in 2015 when the market peaked at 97GW of coal commissioned. Climatescope also revealed that clean energy dollars are flowing to more nations than ever. As of year-end 2017, some 54 developing countries had recorded investment in at least one utility-scale wind farm and 76 countries had received financing for solar projects of 1.5MW or larger. That’s up from 20 and 3, respectively, a decade ago. The Climatescope methodology was revamped for 2018 to reflect current market realities, which have shifted dramatically since BNEF first launched the project in 2012 with support from the Inter-American Development Bank Group’s Multilateral Investment Fund. The current methodology recognizes that clean energy has achieved such scale that certain countries are now established manufacturing hubs while others are best positioned to benefit as importers of low-cost goods. To reflect that, in a change from prior years, countries in the survey did not receive higher scores for hosting manufacturing chains. Despite successes achieved by clean energy to date in developing countries, Climatescope included sobering findings about the scale of the challenge ahead. While new coal-fired capacity additions fell to their lowest level in over a decade in 2017, actual generation from coal-fired plants rose 4% year-on-year to 6.4TWh. And despite ample evidence that new-build renewables can underprice new-build coal-fired plants, 193GW of coal are currently under construction in developing nations today according to Coalswarm data. Some 86% of this capacity is due on line in China, India, Indonesia and South Africa. 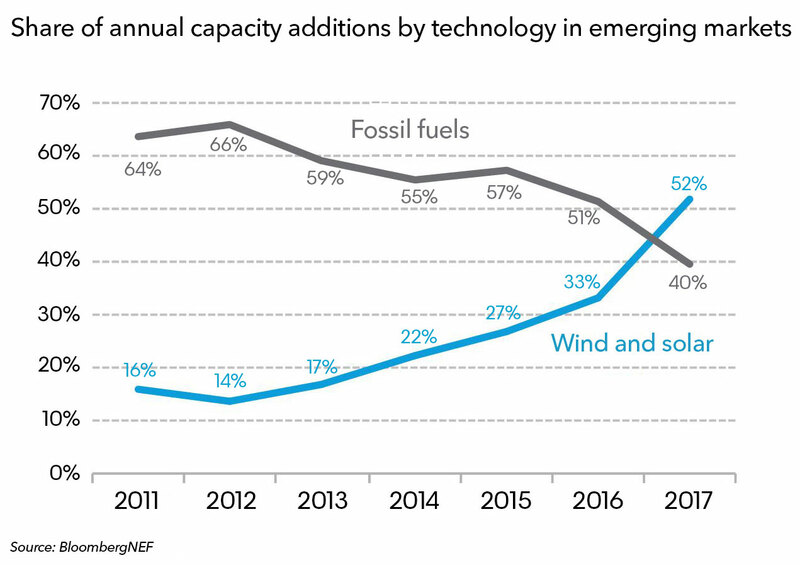 In the context of keeping global CO2 emissions in check, the longer-term challenge for clean power is not just to beat out new coal-fired power plants for new-build opportunities. Rather, it is to displace existing coal-fired plants, many of which have just recently come on line. China and India get approximately two thirds and three quarters of their current power from coal, respectively. Combined, these two countries added 432GW of coal capacity in just the 2010-2017 period (by comparison, the U.S. has a total of 260GW of coal on line today). Faced with significant pressure to expand energy access (India) and keep power affordably priced (China), policy-makers will be reluctant to de-commission these new plants. No less than 81% of all emerging market coal-fired capacity is located in these two nations alone. Finally, Climatescope highlighted growing challenges associated with integrating large volumes of variable resources into existing power markets and the role they can play in depressing wholesale power prices. Further growth will require a variety of solutions, including expanded transmission capacity, demand-response programs, and power-storage technologies. Climatescope is a public resource intended to help developers and investors screen opportunities, policy-makers understand policy frameworks around the globe, and researchers access timely, but difficult to collect, data. The complete Climatescope survey, including complete data sets for all 103 emerging markets, can be found at www.global-climatescope.org.